Koinonia: what's in a tense? [Greek]: fellowship, to communicate, community, communion, association, participation, contribution, distribution, sharing. maybe you know the feeling...sitting or standing in church, and you find yourself singing along to the words of a song you're not so sure you can really agree with...maybe it's a season of life, maybe it's an issue you've long struggled with...and then there are others. There are songs that you can hardly bring yourself to sing because they represent so much of what you long for it feels unreal that it could possibly be true. The last few weeks I've felt both. Refrain: Come of the feast of heaven and earth! Come to the table of plenty! God will provide for all that we need, here at the table of plenty. 1. O come and sit at my table where saints and sinners are friends. I wait to welcome the lost and lonely to share the cup of my love. 2. O come and eat without money; come to drink without price. My feast of gladness will feed your spirit with faith and fullness of life. 3. My bread will ever sustain you through days of sorrow and woe. My wine will flow like a sea of gladness to flood the depths of your soul. 4. Your fields will flower in fullness; your homes will flourish in peace. For I, the giver of home and harvest, will send my rain on the soil. I couldn't. I wasn't "feelin' it" to say the least. My friends in South Sudan are quite literally running for their lives. They have been forced from their homes by violence between groups claiming to want what's best for them, by tanks and air gunships firing on their homes, they're leaving their homes with whatever food they can carry on their backs/heads. It's rainy season. It rains...ahem, POURS...every day. Sometimes ALL DAY. They're sleeping in the bush. Under trees. You know that feeling when you get drenched in a downpour when leaving the grocery store as you run to your car? You can't wait to get home to put on dry clothes? What if there was no home to go to. No dry clothes to put on. No dry wood to make a fire to warm up by. It's these little things that make their reality easier to imagine or relate to. And then this Daniel L. Schutte fellow wants me to believe that my God, my friends' God, is the giver of home and harvest? Here at the table of plenty??!?!?! Where? what table? The table of the "American Dream" the western table of luxury and choice and options? The table set for a few? My friends know not such a table. This is my reaction. HOWEVER. 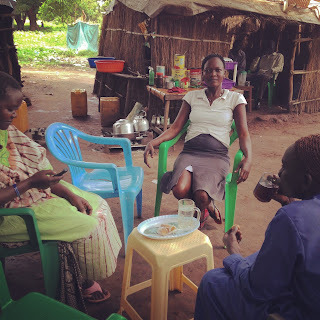 We have an email chain, in which we share communications we've had with our South Sudanese friends. And throughout the reports of conversations with all different people on the ground there, there is one overwhelmingly consistent thread. "Lu mbara be" (God is Greater). Our friends consistently say 2 things: "Pray for us/do not forget us" and "Lu mbara be." They seem to know Him better than I. These, my friends, who are suffering so, are, at least at times, better aware of the fact that God is greater than their circumstances. Better aware than I am. Maybe they'd been able to sing. Maybe they'd be able to sing their hearts out in longing for such a table of plenty. Maybe they'd rejoice for those times past when they've feasted on goat and beef and rice and tea sweet enough to make your hair stand on end...times when they have known such a table. Surely they'd put my unbelief to shame. "We will feast in the house of Zion"
We will feast in the house of Zion. We will sing with our hearts restored. "He has done great things," we will say together. We will not be burned by the fire, he is the Lord our God. We are not consumed by the flood; upheld protected gathered up. for the promised morning O, how long? O God of Jacob, be my strength. and from the garden to the grave, bind us together, bring shalom. For some reason, only one week later, the feasting was more believable...was something I could grab ahold of. I couldn't quite put my finger on why. Until I realized that perhaps it was the verb tenses. "Table of plenty" seems to communicate a plenty we know now, a sustenance "through sorrow and woe"...a feast table where everyone's friends, where fields produce everything you need to flourish, where there's peace in abundance. I couldn't get on board. It's just not the reality that so much of the world is experiencing, let alone my friends. But, "We will feast" felt different. It felt an acknowledgement of the floods, the dark of night, the vows broken, the betrayals, the tears...and a proclamation that one day we will weep no more. That on the other side of the now, we will have hindsight and the the view of God's faithfulness, having done great things. Our hearts restored while feasting at HIS table. It felt like it was holding claim of what is to come. Maybe some of you theological or grammar scholars would say I'm wrong, would dissect the verbiage in both songs and say they're both saying the same thing. That's fine. They still *felt* different to me. And as I write, I realize that maybe it's not the verb tenses after all...maybe it's the presence of lament in the latter...you could call it the "tone." The first was a "cheer up! this is what's true!" which I didn't and don't feel capable of, and the latter is a "it's achingly hard now, and one day, that ache will be gone" and to THAT I say AMEN. Let it be so. Thinking of you and your friends tonight. Praying deeply without words. Bob. Good words, Heidi. Thank you. I get what you're saying! Sending love. Praying for home for them. Thank you Heidi. Continuing to pray for our friends in South Sudan. Sin, cloaked in power unchecked chokes the very life of those it proclaims to serve. Your service to God and his people is a huge step to loosen sin's grip. Thank you.